1988-05-20 Application filed by Glasstech Solar, Inc., Asahi Glass Co. Ltd. filed Critical Glasstech Solar, Inc.
2000-07-24 First worldwide family litigation filed litigation Critical https://patents.darts-ip.com/?family=21981205&utm_source=google_patent&utm_medium=platform_link&utm_campaign=public_patent_search&patent=WO1988009265(A1) "Global patent litigation dataset” by Darts-ip is licensed under a Creative Commons Attribution 4.0 International License. A solar cell substrate comprising a glass substrate (20) and a transparent electrically conductive layer (22) formed thereon, said conductive layer having a plurality of polygonal projections (24), having approximate diameters of from 0.1 to 0.3 um and height/diameter ratios of at least 0.6. The present invention relates to a solar cell substrate useful in the production of amorphous silicon solar cells. As shown in Figure 1, a prior art amorphous silicon solar cell is illustrated generally as 8 and comprises a transparent insulating substrate 1, a transparent electrically conductive layer 6 composed of a p-type amorphous silicon layer 3, an i-type amorphous silicon layer 4, an n-type amorphous silicon layer 5, and an aluminum electrode 7 acting as the back contact. This configuration is practically used as a photoelectric conversion device capable of being produced at a relatively low cost. Such an amorphous solar cell 8 is designed so that light enters the solar cell through the transparent insulating substrate 1 and is absorbed mainly by the i-type amorphous silicon layer 4. An electromotive force is generated between the two electrodes, the transparent electrically conductive layer 2 and the aluminum electrode 7 , and electricity is led out of the solar cell by a conductor 10. For such an amorphous silicon solar cell, it is most important to improve the photoelectric conversion efficiency. As a method of achieving this, it is known to roughen the surface of the transparent electrically conductive layer. By roughening the surface, incident light is scattered at the interface between the transparent electrical ly conductive layer and the amorphous silicon semiconductor layer. The effect of this optical scattering is to reduce the surface reflection loss of the incident light and to increase the absorbance in the i-type amorphous silicon layer. As a result of multiple reflection and refraction in the amorphous silicon semiconductor layer, the length of the optical path increases and the light-collecting efficiency of the amorphous silicon solar cell for long wavelength lights will be improved by the light-trapping effect in the i-type amorphous silicon layer. The short-circuit current density will also be increased, thereby improving the power generation efficiency and the photoelectric conversion efficiency. As specific methods for such surface roughening, Japanese Unexamined Patent Publication No. 57756/1983 discloses an average particle size of the surface of the transparent electrically conductive layer from 0.1 to 22.5 μ m; Japanese Unexamined Patent Publication No. 201470/1984 discloses the preparation of a transparent electrically conductive layer composed of crystal grains having an average grain size of from 0.1 to 0.9μ m; Japanese Unexamined Patent Publication No. 103384/1984 discloses an average grain size of fine crystals constituting a transparent electrically conductive layer to be at least 300 Å; and Japanese Unexamined Patent Publication No. 175465/1985 discloses forming a silicon oxide coating layer having a haze of at least 1% and having a number of projections having a diameter of from 300 to 500 Å and a height of from 200 to 3,000 Å, to obtain a solar cell substrate having a transparent electrically conductive layer. With solar cell substrates having the above-mentioned structures, it may be possible to increase the photoelectric conversion efficiency to some extent, but they are inadequate for the purpose of greatly improving the efficiency. It is an object of the present invention to provide a solar cell substrate coated with a transparent conductive oxide having an optimum textured surface whereby an improved photoelectric conversion efficiency can be obtained. The present invention provides a solar cell substrate including a glass substrate and a transparent electrically conductive layer formed thereon. The transparent electrically conductive layer has a plurality of polygonal projections having diameters of from 0.1 to 0.3 μm and height/diameter ratios of at least 0.6. Figure 2 is a partial enlarged cross- sectional view illustrating the surface of the transparent electrically conductive layer of the solar cell substrate of the present invention. For the substrate to be used in the present invention, it is possible to employ a transparent glass sheet made of soda-lime silicate glass, aluminosilicate glass, borate glass, lithium aluminosilicate glass, quartz glass or various other glasses. It is desirable for the substrate to exhibit a high transmittance, e.g. transmittance of at least 80%, in a wavelength range of from 350 to 800 nm. It is also desirable to have good insulating properties, high chemical and physical durability and excellent optical properties. In the case of a substrate made of a glass containing sodium, such as soda-lime silicate glass, or a substrate made of a low alkali-containing glass, an alkali barrier coating, such as a silicon oxide, aluminum oxide or zirconium oxide layer, may be provided on the substrate in order to minimize diffusion of ions, including sodium, from the glass into the transparent electrically conductive layer formed thereon. The transparent electrically conductive material formed on the glass substrate is preferably made of a transparent metal oxide having a desired conductivity, such as tin oxide doped with from 0.1 to 5% by weight of fluorine, tin oxide doped with from 0.1 to 30% by weight of antimony, or indium oxide doped with from 0.5 to 30% by weight of tin. Among those described, a transparent electrically conductive layer made of fluorine-doped tin oxide is most suitable for a solar cell substrate, since it is possible to readily obtain a sheet resistance lower than 30 Ω /♢ . The fluorine-doped tin oxide is resistant to chemical reduction caused by hydrogen plasma, to which it is exposed during the formation of amorphous silicon layers in a plasma enhanced chemical vapor deposition chamber. Referring now to Figure 2, the solar cell substrate shown has a transparent electrically conductive layer with a roughened texture over its entire surface. Namely, the transparent electrically conductive layer 22 has a plurality of projec tions 24, each having a diameter D of from 0.1 to 0.3 μm, and ratio of a height H to a diameter D of at least 0.6, preferably from 0.7 to 1.2. The height H of such projections is preferably from 0.1 to 0.6 μ m , more preferably less than 0.25 μm. Further, the projections 24 are preferably formed with a pitch P (summit to summit distance) of from 0.1 to 0.5μm, for, if the projections are too far apart from each other, the transparent electrically conductive layer does not effectively cause light scattering. The shape of the projections vary. In a typical example, the shape of the base portion of each projection is tetragonal or has a shape of a higher order polygon. Atmospheric chemical vapor deposition automatically produces a textured oxide layer. The shape of the textured projections depend on the chemical composition of the layer. In the present invention, projections having a diameter outside the range of from 0.1 to 0.5μm or a height/diameter ratio outside the range of at least 0.6, may be present to some extent so long as more than 80% of the surface topography conforms to the preferred specifications. The transparent electrically conductive layer should have a sheet resistance value less than 30Ω /♢ , preferably from 4 to 10Ω /♢ . This range is desirable particularly in view of avoiding ohmic losses in a large area substrate. In the present invention, the haze is most preferably from 8 to 30% in view of the above-mentioned relationship between the particle shape and the optical properties needed to enhance the photoelectric conversion efficiency of the solar cells. The transparent electrically conductive layer of the present invention may be prepared by various conventional methods, such as chemical vapor deposition, pyrolytic spraying, sputtering, vacuum deposition, ion plating or dipping. Of these methods, chemical vapor deposition and sputtering are most preferred, since projections having the above-mentioned diameter, height and height-diameter ratio, can readily be obtained in a controlled manner. The invention is illustrated by the following examples, but is not intended to be limited to the details therein. Nine samples of solar cell substrates differing from one another in the surface texture of the transparent electrically conductive layer were fabricated. Each substrate consisted of a soda-lime silicate glass sheet (4 inch x 3.5 inch x 1.1 mm thick) and a SiO2 layer of 800 Å thick formed thereon. Preparation of transparent electrically conductive layer of SnO2 was accomplished by using SnCl4, H2, CH3OH, and HF carried by nitrogen gas, as reactive gases. The SnO2 layer was prepared in a belt conveyor atmospheric chemical vapor deposition furnace having both heating and cooling zones. The heating zone included a four inch wide nozzle for supplying the reactive gases. This nozzle has five fine slit gas outlets; SnCl4, and dilution nitrogen flows out of slit number three, the middle slit; H2O, CH3OH, HF and their dilution nitrogen flows out of slits 1 and 5; nitrogen to separate the groups of reactants flows out of slits 2 and 4. Furthermore, the distance between the glass substrate and the gas outlets is preferably adjustable. Sample No. 1 A glass substrate coated with a SiO2 layer to a thickness of 800 Å, was introduced into the above CVD furnace at a belt conveyor speed of 0.20 m/min. and heated to a substrate temperature of 600 °C. The reaction gases were then blown onto the substrate by the gas supply nozzle to form the SnO2 layer. The gas compositions were 0.025 liter/min. of SnCl4 and 1.5 liter/min of N2 from the central slit; 1.5 liter/min. of N2 from the separating lines; and 0.93 liter/min. of H2O, 0.015 liter/min. of HF, 0.017 liter/min. of CH3OH and 1.5 liter/min. of N2 from the outerlying slits. Sample 2 to Sample 9 were fabricated in the same CVD furnace with the conditions shown in Table 1. (i) Height of projections: The total thickness, t1, of the transparent electrically conductive layer formed on the substrate was initially measured with a feeler-type thickness meter (Taly-step; Tailor-Hobson Co., needle tip 12.5 μm in diameter). Then an area of the layer was abraded with a 0.5μm diamond paste under a load of 500 g/cm2. The layer thickness and the haze in this area were measured at intervals during the abrasion operation, and the layer thickness t1 at the time when the haze became 2% or less was determined. The difference between the initial thickness t0 and the thickness t1, i.e. ti- t1, is equal to the height of the projections, (ii) Diameter of projections: A scanning electron micrograph of the transparent electrically conductive layer formed on the substrate was taken, and the diameter of the projections was measured from the micrograph. (iii) Table 2 shows the measured values of H, D and H/D for each sample. The photoelectric conversion efficiency, the short-circuit density, the open-circuit voltage, and the fill factor of solar cells made on sample are also shown. Samples 1 to 7 all have H, D and H/D ratios within the range of the present invention. 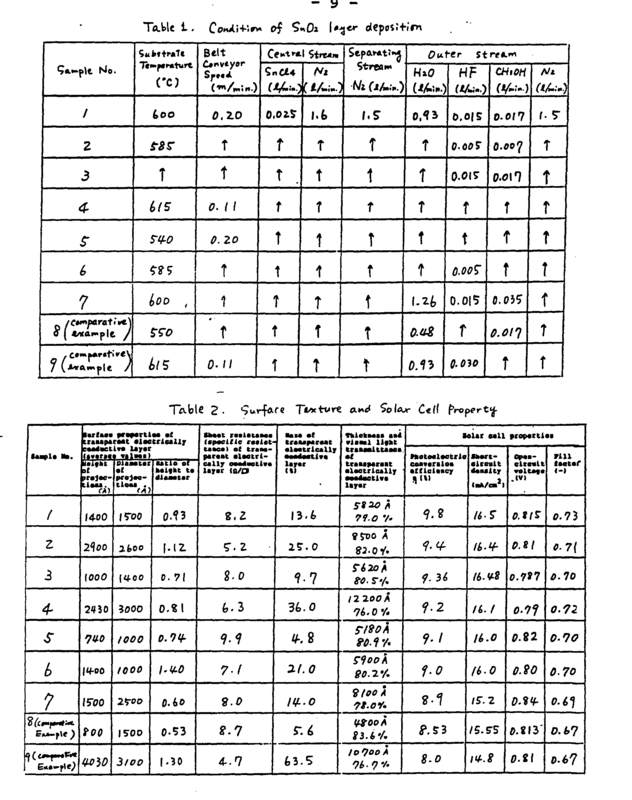 Samples 8 and 9 have H, D or H/D ratios outside the range of the present inventions and it can be seen that the properties of the solar cells made on these samples are inferior to those of the solar cells made on the samples 1 through 7. 100 Å), an i-type amorphous silicon layer (thick- ness: about 4,000 Å), a n-type amorphous silicon layer (thickness: about 1,000 Å), and a metal electrode layer (thickness: about 10,000 Å). In the present invention, the incident light enters the solar cell through the interface of the transparent electrically conductive layer and the amorphous silicon layer and penetrates into the amorphous silicon layer. When the electrically conductive layer has a textured surface, the light is scattered by the textured surface and the scattered light is taken into the amorphous layer. The optical path in the silicon layer is elongated, and the absorption efficiency of light is thereby improved. This effect is particularly remarkable in a long wavelength range where the absorptive coefficient of silicon is small. In order to increase the scattering of light in this long wavelength range, certain levels of the height and the diameter of projections are required. The transparent conductive layer of the present invention has a plurality of projections having diameters of from 0.1 to 0.3 μ m and height/diameter ratios of at least 0.6, preferably from 0.7 to 1.2. It is desirable for the diameter and height/diameter ratio to be quite large since if the diameter is less than 0.1 μ m and/or the height/diameter ratio is less than 0.6, the projections become too small and/or too flat to efficiently produce light scattering. However, if the diameter is larger than 0.3 μ m, and/or the height/diameter ratio is larger than 1.2, the height becomes too great, which makes it difficult to uniformly deposit an amorphous silicon layer on the transparent electrically conductive layer. In this respect, diameter and height/diameter ratio are restricted by the thickness of the amorphous silicon layer or the ability of the amorphous silicon deposition system to conformally deposit layers while maintaining good electrical properties. Similarly, to form projections having diameters of larger than 0.3 μ m, it is necessary to heat the glass substrate up to high temperatures, which is not preferable for a glass substrate. (1) the short circuit current density is improved by about 1 mA/cm2; and (2) the photoelectric conversion efficiency is improved by about 0.5% absolute units. While the best modes for carrying out the invention have herein been described in detail, those familiar with the art to which this invention relates will recognize various alternatives and embodiments for carrying out the invention as defined by the following claims. 1. A solar cell substrate, comprising a glass substrate and a transparent electrically conductive layer formed thereon, said conductive layer having a plurality of projections, having diameters of from 0.1 to 0.3 m and height/diameter ratios of at least 0.6. 2. The solar cell substrate as in claim 1, wherein the height/diameter ratio of the projections is from 0.7 to 1.2. 3. The solar cell substrate as in claim 1, wherein the transparent electrically conductive layer is selected from the group consisting of tin oxide, fluorine- doped tin oxide, antimony-doped tin oxide and indium tin oxide. 4. The solar cell substrate as in claim 1, wherein the transparent electrically conductive layer has a sheet resistance of from 4 to 10Ω /♢ . 5. The solar cell substrate as in claim 1, wherein the transparent electrically conductive layer has a haze as from 8 to 30%.